We can definitely see that the Kardashian family love Balenciaga. Not only do the sisters have quite a few in their collection, baby Mason Disick travels in style too with his Balenciaga Square Tote. Today, March 31, 2010, Kim is wearing a fun peachy pink romper and was out shopping with nephew, Mason out in Miami, FL. She carries her 2010 Sahara Classic City bag with her. To shop Kim's look, click here for her Miss Ferriday romper, here for her Sam Edelman Gigi sandals, here for similar bag, and here for Mason's Orbit Stroller. Matches Fashion got in their first piece of Giant Rose Gold Hardware! It is the 2010 Sahara Giant Day. The Rose Gold Hardware is definitely different from what I was expecting. The Balenciaga Sales Associate says it is suppose to look more like the aged brass hardware than gold giant hardware and thus the hardware is much darker. It definitely looks like a Gunmetal color with hints of pink color. 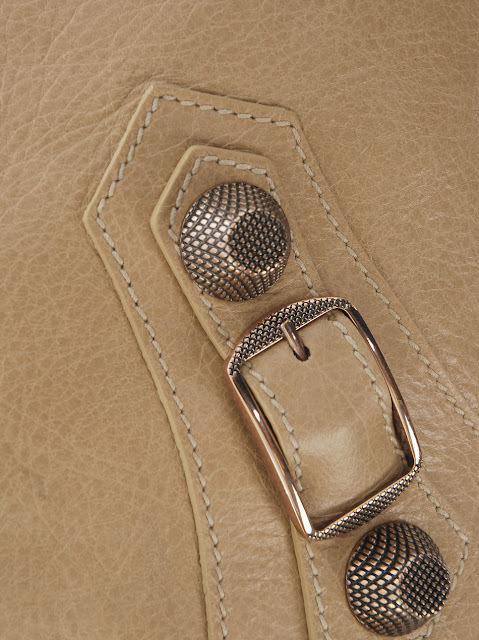 What I found was odd was that they were not able to match the zipper's color to the hardware, because the thimbles and buckles have this "aged" look to it, but the zipper looks rose gold. It is still a gorgeous combination, they should think about putting out another Gunmetal hardware like when they released the 2007 Neiman Marcus LE city. Check it out here at Matches Fashion. Nicole Richie was spotted attending traffic school class on March 31, 2010 in Van Nuys, CA. The newly brunette beauty has been going to these classes for her DUI back in 2007. She pairs a red scarf with black skirt and tights along with matching black oxfords. Lace-up oxfords are a huge trend at the moment, I sometimes find myself browsing around for the perfect pair! She tops off her casual yet chic outfit with her classic black Balenciaga City bag, though I really wish she would start carrying her other Bals too. It also looks as though her poor City has suffered a white stain on the front! Kourtney Kardashian and sister Kim hit a Miami beach today, March 31, 2010. Camera crews followed them everywhere as it appears they are filming for their reality show. What's interesting is Kourtney's choice for a beach bag - a Balenciaga Giant Covered Hardware Day in white. Though it is such a crisp, and stunningly bright color, white is the easiest color to get dirt stains on and color transfers. I still love my Ivory bags though! Kourtney Kardashian was spotted strolling around in Miami, FL, on March 24, 2010. 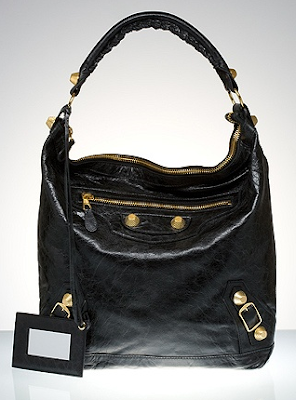 She is carrying her beautiful Balenciaga Black Giant City with Gold Hardware. Her city bag compliments her black floral dress. As always Gold Hardware against black leather is a striking combination. It adds some "oomph" to an outfit. Lauren Conrad was spotted leaving a flight at our nation's capital today March 27, 2010. The reality star beauty is carrying a Balenciaga Weekender Bag in Anthracite as her carry-on choice. LC is in Washington DC for a book signing. To shop LC's airpot outfit: click here for her Rainbow sandals, here for her Ray-Ban sunglasses, here for similar scarf, click here for similar & cheaper quilted flap bag, and here for her Balenciaga Weekender bag. Alessandra Ambrosio and daughter Anja Louise was spotted on March 26, 2010 heading to a local park in Malibu, CA Looking gorgeous as usual, she wears a white ruffle miniskirt, black leather boots, with matching leather jacket. She carries her well-loved Balenciaga Argent GSH City from the 2008 season. Her little girl is such a cutie- she must take after mommy! Ashlee Simpson-Wentz was spotted today March 26, 2010 strolling around in Beverly Hills. She is carrying a gorgeous black Balenciaga Giant Covered Hardware Pompon. The bag matches her Goth look- black hair, black pants, black shoes! Ever since she and hubby Pete Wentz got together, she has been dressing to match him. I'm going to merge two posts in one since Aloha Rag now requests their Balenciaga bag pics not be posted on the internet. So if you would like to see the bags, I would be more than happy to forward you the email. You can either email me or leave a comment. Email them at love@aloharag.com if you're interested. Supermodel beauty Alessandra Ambrosio and a friend hit new night club Trousdale in West Hollywood, CA on March 24, 2010. She carries a gorgeous Balenciaga Argent Giant Silver City from the 2008 season. This light gray shade was very popular when it first made its debut, and Bal Lovers are still craving for the now sold out color. It makes an amazing neutral that is not prone to show dirt as quickly as white. 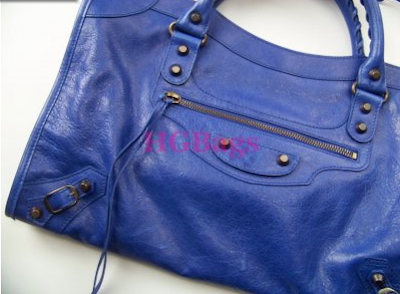 Though, we can see that her handles have darkened significantly, one of the disadvantages to owning a Balenciaga bag. Good thing these bags can be easily rejuvenated at LMB at a small fee. Vanessa Hudgens and boyfriend Zac Efron were spotted shopping together at Lumberjack Shopping Center in Malibu, CA on March 24, 2010. 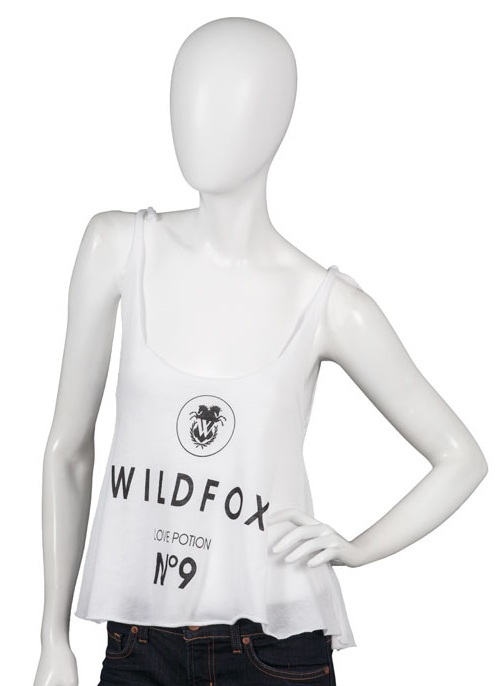 Vanessa is wearing a white Wildfox Couture tank available at Singer22 for $55. She continues to wear her floppy hat and Balenciaga Black Part-Time Bag. She looks cute as usual! Vanessa Hudgens was all smiles are she was spotted leaving a medical building on March 23, 2010. She wears a cute shirtdress and adds a belt to her waist for a more fitted look. Of course she accessorizes her spring outfit with her Black Balenciaga Part-Time Bag with Gold Hardware. She tops it off by wearing a floppy hat on top of her luscious, wavy locks. I love looking at all these colors together. HGBags took wonderful pictures for these new arrivals, definitely worth blogging about. :) Light Olive and Sorbet together look delicious together - like a strawberry. The new Click coin purse is definitely a cutie. These kiss lock closure coin purses bring back memories of when I was a little girl owning something similar and not as expensive. Haha. More Balenciaga Ballerina Flats added today! Including Sang, Sahara, Sorbet and Anthra from the Spring 2010 Collection - you have all been asking that we stock 35s and 41s and we listened - they are here! Plus many other sizes as well. Click here to view/purchase. Brand new Balenciaga just added from the Fall 09 and Spring 2010 collections including several styles in Sorbet and the sought after new accessory The Click! 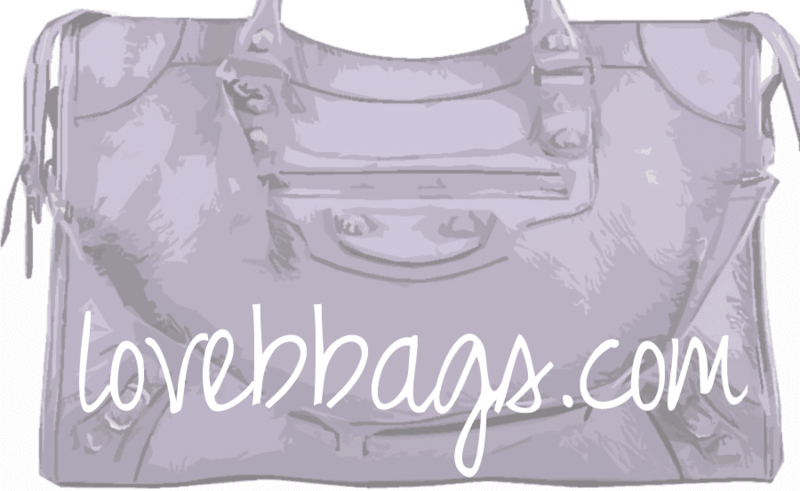 Click here to view bags. Mason Dash Disick's Diaper Bag - Balenciaga Square Tote! New mommy Kourtney Kardashian carries a woven shoulder bag as her choice of purse, but for son Mason's baby gear, she packs it in a Balenciaga Square tote! Auntie Kim Kardashian was spotted too helping them shop in Miami on March 22, 2010. Found these gorgeous modeling pictures on a Japanese website. These are great reference pictures for those who can not try these on in real life before buying. I have not considered the Sunday tote at all because of its open top, but seeing these pictures make me reconsider! Are any of these bags on your wish list? Kim Kardashian was spotted today March 19, 2010 at Walgreens in Miami promoting her new weight loss product. 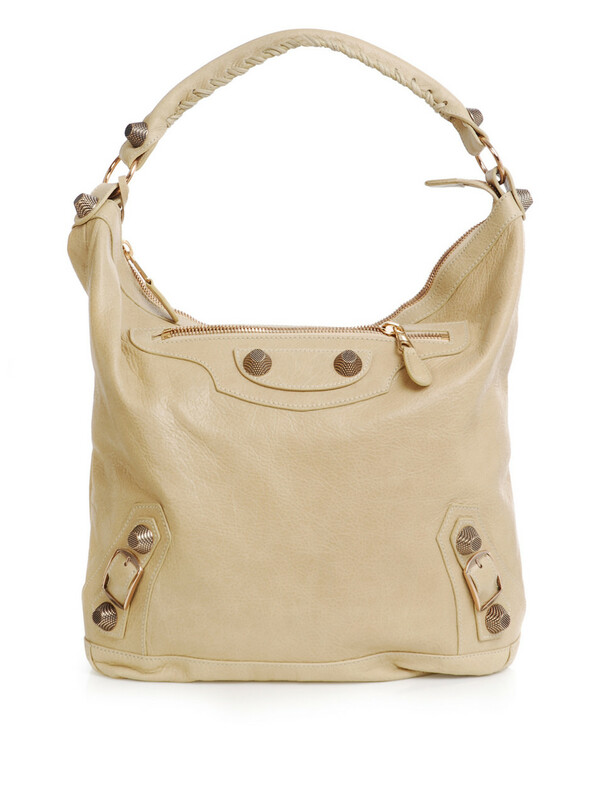 The reality star is carrying a 2010 Balenciaga Sahara City with Classic Hardware. She keeps it pretty and feminine by wearing a white sleeveless top and a floral skirt with matching beige sandals. Sahara looks like a favorite among celebs as Lo Bosworth was also seen carrying the same exact bag. To shop Kim's outfit: Click here for similar skirt (she's wearing Bebe but its no longer available), click here for similar top, click here for similar sandals (she's wearing Pierre Hardy strappy sandals that are no longer available), and click here for similar bag. Brand new Balenciaga just added from the Fall 09 and Spring 2010 collections - many of you have been asking for the Outremer City and Black Velo and we have been responding that we are sold out. Please realize these were unclaimed pre-orders. Thank you. Check out these new adds to our pre-owned section of Balenciaga - So many Balenciaga Holy Grails - do not miss them!! Plus further markdowns. Simon Cowell and fiance make-up artist Mezghan Hussainy were spotted on Sunday, March 14, 2010 shopping at John Varvatos. It appears that Miss Hussainy is also a Balenciaga fan! She was seen last month carrying a beige Lune bag, and in this picture she is carrying a red Balenciaga City. It looks like 2009 Sanguine from here! Can't wait to see what she carries next. Nicole Richie was spotted today March 16, 2010 leaving Kid Fit, a physical education class for children!Daughter Harlow is holding hands with a cute little buddy who bears a resemblance to Shiloh Jolie-Pitt. How adorable!!! Nicole's black Balenciaga City bag is holding up so well.. she has been carrying it as a daily bag for years. Still fabulous after all this time. Earlier today I inquired Giant Gold Hardware stock at the Balenciaga boutique in New York. Email them at: newyork.store@us.balenciaga.com or call 212.206.0872 if interested. I usually work with Bill with my purchases. He is VERY quick to respond, great SA! If you want to contact him by email just add: Attn: Bill to the subject line. 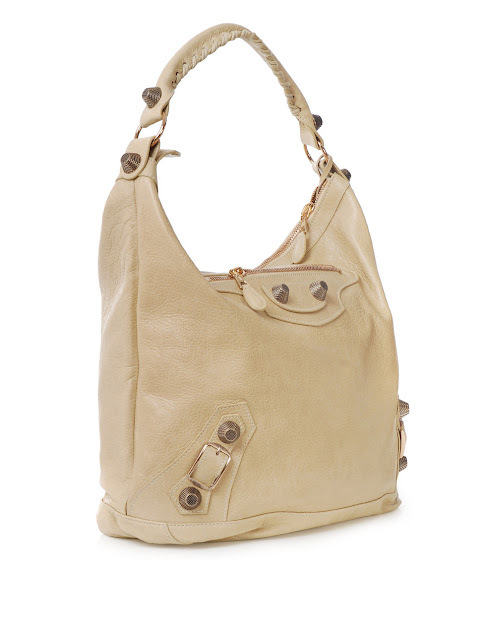 Another great stocklist of coming arrivals from Balenciaga to HGBags! Many of the colors from 08 and 09 that you are all asking about on a daily basis, including more Rouge Vermillion. This is truly a rare opportunity to find these SOLD OUT, RETIRED colors that are BRAND NEW, never worn, BELOW RETAIL!!! FULL Payment (FREE SHIPPING will be offered to anyone that reserves ahead of time) will be required at this time to hold an item, but will be REFUNDABLE in full if you are not pleased with the photos when the item arrives to us. When it arrives, photos will be sent out and you can confirm your item at that time. If you are not pleased with your item from the photos, we will work diligently with you to find another leather choice or refund your full payment - there will be multiples of most items, so again we will do our best to accommodate any leather requests. Payments will be taken via paypal, googlecheckout, credit card, money order, western union or bank wire. If you are not reserving a bag, there is no need to request photos - the bags will be posted to our site when they arrive and we will send another e-mail notification that they are there for viewing and purchase on a first come, first serve basis. FREE SHIPPING will be offered for anyone that reserves ahead of time - UPS Ground domestic and Priority Mail International. Shipping info and our return policy can be found on our site. We welcome international buyers and will do our best to try and make your buying experience the easiest as possible! Please email her at hgbags@gmail.com if interested.